GFCA's Transportation Committee just released the results of a survey conducted early in 2014 to collect community opinions on transportation questions and trails in Great Falls. More on the findings are available here. The findings will also be presented with discussion at GFCA's Town Hall meeting on Sept 9. GFCA and other community organizations have been long-time supporters of the concept of Resident Curatorship (RC) as a commonsense solution to the need to preserve historic county-owned buildings, such as the farmhouse on Turner Farm in Great Falls. In concept, an RC program could help the restoration and preservation of historic buildings by leasing buildings to private parties who agree to restore and maintain them properly. This summer, Fairfax County released a proposed RC program for comment. After review, the GFCA and the Great Falls Historical Society (GFHS) have joined forces in calling for changes to the proposal. GFCA and GFHS formed a Working Group in July to review the nearly 250-page report that Fairfax County developed proposing a county RC program. In a letter to the County sent on Aug 6, GFCA and GFHS called for a stronger set of criteria in selecting historic properties, urged that the Turner Farmhouse be selected as the County’s pilot project to demonstrate how the RC works, and called for a public hearing so other community groups and residents could comment on the RC plan. The recommendations developed by the Great Falls working group also suggested changes to program administration, standards for curator selection, and leasing terms. Click here for a copy of the Working Group recommendations. Last year, GFCA passed a resolution supporting the Mark Turner Farmhouse on Georgetown Pike as a primary candidate for the new RC program. Unfortunately, this historic home has become a community eyesore with no upkeep since acquired by FCPA four years ago. It is hoped that quick action to implement an RC program could lead to restoration of the Turner Farmhouse and other historic structures owned by the County. 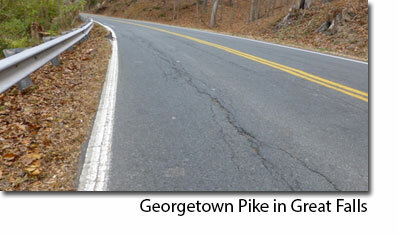 The Virginia Department of Transportation will begin repaving eight miles of Georgetown Pike (Route 193) from I-495 to Springvale Road beginning Sunday, August 10, 2014 (weather permitting). The work will be performed at night from 9 p.m. to 5 a.m. Sunday through Thursday and 9 p.m. Friday to 9 a.m. Saturday. This work is expected to take about two months to complete, weather permitting. Drivers are asked to consider taking alternate routes during the repaving operation on Route 193. The road will be milled to a depth of four inches and replaced with 2.5 inches of intermediate asphalt and 1.5 inches of surface asphalt. Some areas of the existing pavement will require deeper patching prior to the asphalt overlay. GFCA has been a long-time supporter of the concept of Resident Curatorship (RC) as a common-sense solution to the need to preserve historic buildings, such as the historic farmhouse on Turner Farm in Great Falls. Fairfax County Park Authority (FCPA) has responsibility for the County’s Resident Curatorship programs, authorized by the state in 2011. This week, FCPA issued a draft “Resident Curatorship Implementation Study” and is seeking public comments by August 6. GFCA also will sponsor a working group of interested parties to evaluate the report and provide comments to FCPA prior to August 6. At GFCA’s monthly TownHall meeting (July 8), the past and future of Turner Farm was discussed. Representatives of civic groups active at Turner Farm presented history and described their groups’ activities and plans. The meeting ended with a high-level discussion of the potential direction of future development at Turner Farm. The meeting was triggered by Fairfax County Park Authority’s (FCPA) plans to revisit the Master Development Plan for the Farm in order to incorporate the recently acquired Farmhouse and related lots into the Plan. Created in 2000, some updating of non-Farmhouse elements of the Plan may also be undertaken. GFCA has been asked by the FCPA to facilitate community discussion and provide input to FCPA prior to the start of formal Plan revision activities in May 2015. These activities will include more community comment and involvement, starting as early as next summer. The meeting was a productive exchange of ideas and philosophies for use of the Farm. Beverly Bradford, representing Save the Farm (one of the principal groups responsible for creating the funding and support to establish Turner Farm as a park) presented the history and important developments in the life of Turner Farm. A round table discussion followed the presentation, anchored by John Adams (Georgetown Pike Association), Ginger Nelson Yale (Turner Farm Team), Charles Olin (Analemma Society), Richard Bliss (former Dranesville District FCPA Board Member and founder of Northern VA Conservation Trust), Chris Lehman (Great Falls Lacrosse Association) and Nicole Gnozzio (Riverbend Pony Club). Many members of these and other groups were in attendance and participated in the meeting. Overall, people agreed that the program was informative and helped foster a better understanding of Turner Farm and its position as a unique resource for our community and for Fairfax County. For example, the Analemma Society’s astronomical education programs touch many adults and children from near and far. The equestrian activities similarly benefit many. A consistent theme from all the presentations and discussion is that Turner Farm currently has a practice of “low intensity, dark at night” activities and that maintaining this practice is central to the Farm’s unique aesthetic. Eric Knudsen, GFCA President, held an informal non-binding straw poll at the conclusion asking: “do you support maintaining Turner Farm’s historic focus on ‘low intensity, dark at night’ uses”? Support for this position was unanimous by a show of hands among the 40-50 people in attendance. If you have renewed your membership, thank you! If you have not yet renewed your membership, please take a moment and renew today. If you have any questions about membership and renewals, please contact the Membership Committee. The Great Falls Citizens Association annual election was held June 10, and resulted in the election of four new directors: Matt Haley, Torsten Kracht, Dawn McPhee, and Zaheer Poptani,. Re-elected were President Eric Knudsen, Vice-President Bill Canis, and directors Ralph Apton, Jack Clark, Pam Grosvenor, Scott Knight, Philip Pifer, and Jennifer Semko. The June 10 meeting was also an “Open Mic” forum at which community opinions on a number of topics were discussed. GFCA appreciated Great Falls residents' opinions on these topics in order to frame its agenda for the upcoming year. Continuing for a second year in their positions are Secretary Debbie Copito, Immediate Past President Jackie Taylor, and directors Ruth Carver, Wayne Foley, Bill Harvey, Ed Phillips, and Amy Stephan. At the June 17 GFCA Board Meeting, Bud Thompson was elected as Treasurer and David Kondner was selected to fill an open Board seat. At the May 13 TownHall meeting, a county proposal to expand the Forestville Elementary School septic system to meet code requirements and prevent closing the school was discussed with members of the Capital Projects and Sustainable Design Office of the Fairfax County Public Schools (FCPS). On May 20, the GFCA Executive Board sent a letter to the Dranesville Supervisor and the Dranesville School Board Representative supporting the proposed FCPS recommendations. Assuming all approvals are obtained, design and construction might commence this summer. The current FCPS preference is for a gravity sewer routed through the middle of the Park Authority Nike site property. It would be limited to the minimum size necessary for the school to prevent any other sewer connections. The three other possible options not under active consideration are: replacing existing Park Authority athletic fields with a suitable septic field; several trucks per week pumping and hauling waste; or, a packaged waste treatment facility requiring a suitable storm water channel adjacent to the school and some waste material hauling by trucks. The featured speaker: Steve Nicholson, Coordinator of Capital Projects and Sustainable Design, Office of Design and Construction, Fairfax County Public Schools.